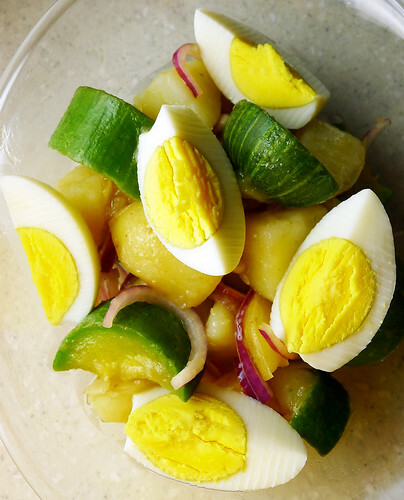 the scent of green bananas: boiled salad. Posted by santos. This entry was posted on 20120701 at 11:47 PM You can skip to the end and leave a response. Wow Santos, thanks for the mention! You're right, everything we got was really fresh...there was a good amount of soil we had to wash off the potatoes. It's funny how such simple things strike the right chord at times! i think that's why i loved your dinner so much--it looked so fresh and delicious. Looks fresh, light and delicious. Love that this is easy to prepare too. Colorful presentation cannot go unnoticed. YUmmy! Perfect combinations, lovely color and I guess the taste is so yummy!Must try! OMG! You're still blogging after all these years!! Hahaha .... keep it up. Just dropping in to say HI!